I have been searching for the perfect chalk board for when this little arrives. I found a few that I like but were either the wrong size or the wrong price. Chalk boards are everywhere now and maybe a little overdone, but they are so fun to use as props in pictures and are fancier than just a piece of paper. 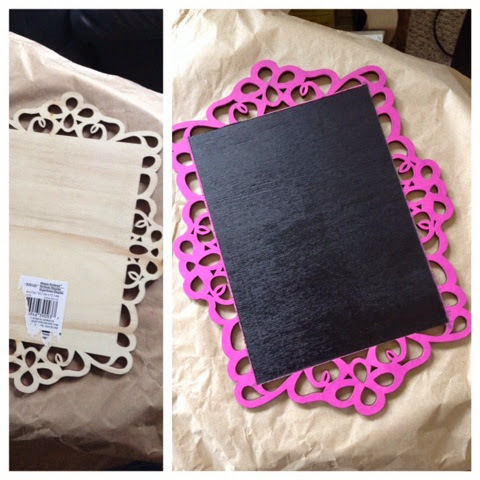 After a trip to Michaels I had the tools to create exactly what I had envisioned for under $7. I already had painters tape and brushes so that left the acrylic paint, chalk board spray paint and the actual wooden piece. I taped the edges to give me the best lines before using the spray paint and, of course, went outside to spray. I did 3 coats which seems to be adequate. The wooden piece was not perfectly even and there were a few spots where the chalk board paint got under the tape, but I was able to mask that with the acrylic paint. If they were spray painted prior, this would be a great activity to do with children. It encourages communication, creativity and can be used in many different settings thanks to chalk pens that are dust-free! Michaels has a large selection of these wooden pieces which could be used for any number of projects.